Superko rules prohibit recurrences of an earlier board position under certain circumstances. The recurrence of such positions could be caused by long cycles, such as triple ko, eternal life or round-robin ko. the type of move recreating the position (see Chinese Superko below). is what the Chinese rules were intended to specify. Note that it could allow an immediate ko recapture if the first capture was preceded by a pass. BGA rules combine this with the basic ko rule to forbid immediate ko recapture. According to Terry Benson, AGA rules were meant to use Natural Situational Superko, but everybody else interprets them with Situational Superko. Korean rules This usually means the game must be replayed. Long cycle rule Repetition of a board position ends the game. Computer Olympiad rules (PJT: ¿used with basic ko rule? The game result depends only on the number of stones captured by either since the first occurrence of the position. Strict Superko (term suggested by Robert Pauli): forbids “completing a non-trivial cycle” (in his terminology). Sound Superko (term suggested by Robert Pauli): forbids “completing a cycle” (in his terminology) that does not include a pass. Fixed ko rule: repeated positions may occur but you are not allowed to make the same move in them. Short cycle rules? : The result depends on the number of moves between the repeats. If there are 3 or fewer moves between the repeats the game is a loss for the player who makes the repeat. If there are more moves between the repeats the game is a draw. 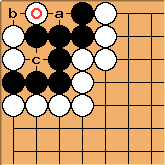 Colour-blind superko: Ignore the colours, suggested as a ko-rule for multi-colour go. Positional vs Situational Superko – discussion over which superko rule is best – don't expect a definitive answer! Article 7: The repetition of the same pattern shall be prohibited unless the right to an alternate move is disregarded. In modern terms, "disregarding the right to an alternate play" means passing. When a pass lifts a ko or superko ban, this is sometimes called "pass for ko threat". There are different versions of the superko rule in which an intervening pass allows a repetition. Yasunaga's seems to say that any intervening pass lifts the restriction on repetition, but it may mean a pass by the player who makes the repetition. The interaction with passes can pose problems with ending the game, but not taking passes into account can lead to strange results. My home page, when I get it up, will have a discussion, and my solution to the problem, based on Combinatorial Game Theory. Meanwhile, for my solution, see Spight Rules. Yasunaga proposed a three-consecutive-pass rule, which is how my solution will usually work. Ing uses a four-pass rule.